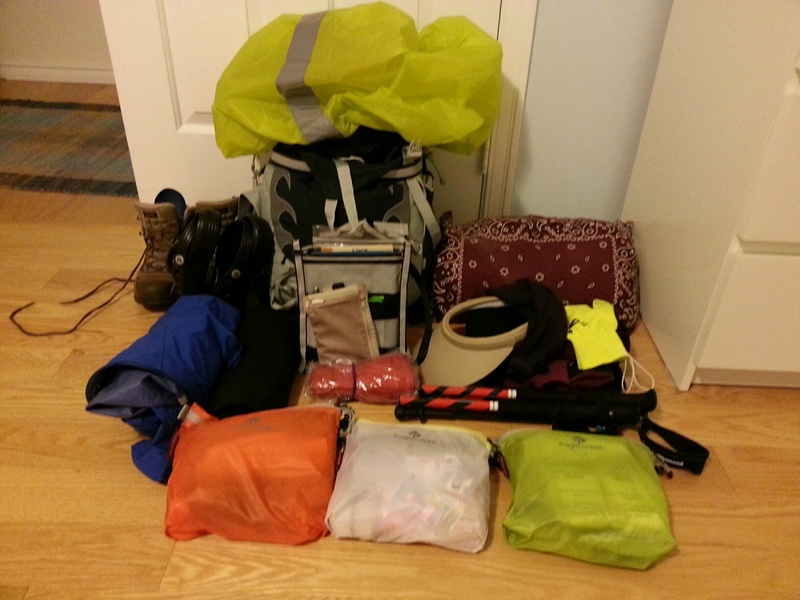 Don’t read this unless you LOVE camino packing minutia. You’ve been warned! The time is drawing close and I’ve got everything ready. Several times over. My husband was away so I was free to indulge myself in camino preparations, with no one laughing as I wore my backpack around the house over my pyjamas. I am confident of my selection of carefully chosen treasures, which I’ll describe below. I am not so confident of my own physical readiness. The other day I walked 15 km on level ground with a very light backpack. And I was TIRED! Through no coincidence, it exactly fits exactly my needs: Brierley’s Maps-Only Guide, my Galaxy Note 2 phone in a wallet case, a waterproof case for said phone, a small notebook and pen, cash for the day. Reflective stripes on one side to alert oncoming drivers in the fog or dusk, but none on the other side in case I want to blend into the darkness. The plain side has a smaller zipped pocket that fits my passport in its new stylish leather case (a retirement gift!). 4 loops placed for handy hooking to either the hip belt or sternum strap of my backpack, to position it so it doesn’t bounce too much as I walk and to relieve some of the weight on the strap around my neck. Strap is adjustable in length and fits over the shoulder or around the neck. I have wrapped adhesive reflective tape around my walking sticks. Also sewed a piece of reflective ribbon across my waterproof pack cover (but then had to seal the seam). All this reflective tape is in recognition that I’ll be walking in foggy drizzly Galica in November-December. Another item I made was a stuff sack for my sleeping bag that can be used as a drawstring backpack or as an over the shoulder shopping bag. The final challenge was to cut slits in the side pockets of my rain jacket so that my backpack hip belt could go through the holes and fasten under my jacket front instead of on top. I did it – cut holes in my expensive lightweight waterproof breathable jacket, but found that it was really not much of an improvement, so I sewed up the holes back up. Spares and extras bag: 350 g of spares and things I might not need but want to have (elastic bandages, extra medications). Fanatics would say I have too much but I prefer to be self-sufficient, if poorly dressed. Altogether it weighs somewhere around 6 kg (plus or minus 500 g, depending on what I’m wearing and how much food and water I have at the time). That is quite close to 10% of my body weight, which is a good rule of thumb. For the journey I am putting some things (walking sticks, pocket knife, sleeping bag) in a small bag that I will discard on arrival. Everything else will be carried on the plane in my backpack. You’ve done well with the weight and I love all your home made stuff – just my style. I would only change the down vest for a fleece one, purely from the experience of the down one getting saturated under my rain jacket last year – it didn’t breath at all and held on to all condensation. Are you going to be blogging en route or reporting on Facebook? Would love to follow your camino. I thought you would appreciate those customized items. I am a little uncertain about the vest, but it Is mainly intended for evenings and cold nights. My sleeping bag is not down, and nights could get cold. Yes, I will be blogging on my Galaxy Note 2. Clare, I’m so looking forward to following your journey. As a veteran, I can say the contents of your pack look pretty spot on. I like to use a down vest but also have a fleece vest – magwood does make a valid point about condensation and down getting wet, however I have never, ever felt the need to have anything extra under the rain jacket as they all seem to hold heat inside. I will only use the vest under my jacket on very cold days. The vest originally had sleeves but I took them off! Hope you left room for that designer handbag you’re going to buy for me…. I doubt that I’ll find one on the Camino. In Madrid I cold buy a whole set of fine luggage to fly home!